Stoves, fireplaces, and even log stacks come in all different sizes, so the 14 inch Marking Wheel Accessory for the Mingo Firewood Marker can be just what the doctor ordered this winter. 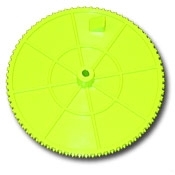 This wheel attaches incredibly easily to your Mingo Firewood Marker Tool, allowing you to mark perfect 14 inch sections of logs or firewood to cut. Don't forget - cutting the right length of wood makes operating heating appliances, starting an outdoor fire, and stacking logs in a woodpile cleaner and more efficient. Get the perfect-sized logs, get them quickly, and get them in the simplest manner possible before your next occasion for using firewood by adding the 14 inch Marking Wheel Accessory to your handy Mingo Firewood Marker Tool. Straight forward purchase with on time delivery.